We are going to be thinking outside of the box today so if that generally frightens you, turn away, eat some chocolate and rejoin us when you are ready. 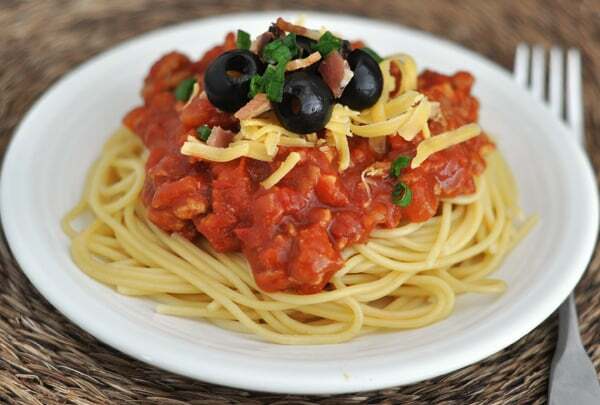 This spaghetti is really not spaghetti, if you know what I mean, especially if you view spaghetti as spaghetti noodles topped with an Italian-style red sauce. What you have here is a variation of a meal I ate growing up that took the idea of spaghetti, spun it around, turned it upside down and did about 30 cartwheels. And the resulting chaos is utterly fantastic. The sauce is still red, I’ll give you that, but instead of being rich and robust with classic deep tomato flavors and Italian herbs, it is smoky and tangy and slightly sweet…and absolutely delicious. My kids were skeptical when I put what looked like regular ol’ spaghetti sauce on the table but then followed it with a plate of olives, cheese and green onions. What the what? Mommy knows what she’s doing, kids, she’s not crazy, I promise. But the combination works – and works well (and comes together really quickly!). 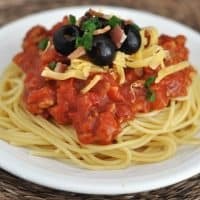 I love the sweet and smoky flavor of the sauce, and then the little niblets of bacon and olives and green onions and cheese and tender ground turkey (following me?) just send it into the crazy-good atmosphere. The lesson we should all learn here, clearly, is that just because it’s spaghetti doesn’t mean it’s spaghetti. Got it? Good. In a 12-inch nonstick skillet, cook the bacon over medium heat until crisp. Scoop the bacon onto a plate lined with paper towels and drain the grease, if needed, leaving a teaspoon or so in the skillet for cooking the ground beef. Return the skillet to medium heat and cook the ground turkey or beef with the onion, salt and pepper. Break the meat into small pieces as it cooks and continue cooking until the meat is no longer pink, 4-5 minutes. Stir in the minced garlic and cook for another minute. Drain any excess grease. Stir in the cooked bacon (reserving any for sprinkling on top, if desired), crushed tomatoes, tomato sauce, oregano, Worcestershire, liquid smoke (if using) and BBQ sauce. Bring the mixture to a simmer cook for 10-15 minutes (the mixture can gently simmer for up to an hour). Boil the spaghetti noodles according to package directions until al dente. Serve the sauce over hot noodles and garnish with toppings of your choice. Note: It is key here to use a BBQ sauce that you really love (as in, if you dip your finger in to have a taste, you'll end up dipping it in 50 more times because it's that good). It might not seem like 1/4 cup is very much but it definitely influences the flavor of this dish. I use my favorite homemade BBQ sauce which has a delicious smoky, spicy and sweet flavor. For the sauce, will it work if I do step 1 & 2 beforehand (previous day & refrigerate) and only do step 3 the day of and in a slow cooker? MJ – I haven’t tried it but it is definitely worth a try! Loved this Mel! I used probably 4 times the BBQ sauce, but since then I made your homemade BBQ sauce and I don’t think I would need as much of it because that sauce is amazing! Although I do like it so much I might still use more. I just made this, it’s delicious! Do you have any experience or idea how long the sauce will last in the fridge? Is it better to freeze it? Thanks! Hi Melissa – I think it could keep refrigerated for 3-4 days. You could definitely freeze it. I like to spoon it into freezer ziploc bags, press out the air so the bags are flat and freeze it like that (I just put it in the fridge the night before I want to serve it and it thaws nicely). This could solve the spaghetti dilemma in my house. I have the most yummy spaghetti sauce recipe and 2 out of 4 kids won’t eat spaghetti. I’m betting they will love this! Amy – if the carbs are too much for you, you can serve the sauce over quinoa or brown rice. Made it last night and my husband just about licked the skillet clean! My kids took it to school for lunch, too! Thanks for sharing!! Sounds intriguing. Bookmarked and I’m anxious to try. Love spaghetti and always appreciate another reason to slurp noodles! I have a recipe nearly identical from a Rachel Ray cookbook of mine! This is a regular at our house, my kids lick their plates clean. I can’t wait to try your version out next week 🙂 Thanks! The family loved it! Even my oldest who usually picks out onion and tomato chunks ate all of it. This looks so great. I would love for you to try out my dad’s spaghetti sometime. I love it! 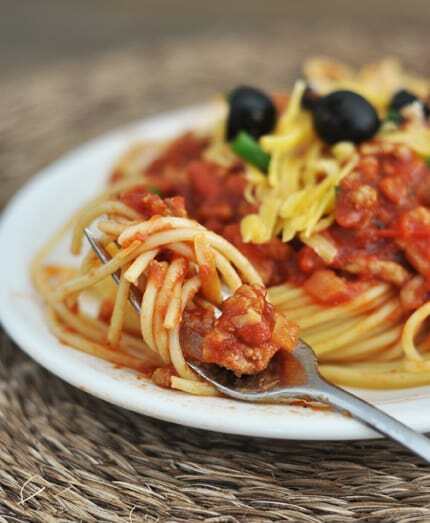 another twist…have you tried putting chili over spaghetti noodles? then top with shredded cheddar and fresh onions…so yummy! You are adorable Mel!! Love reading your posts.. Gonna try this and put my spin of gluten free noodles.. Hope my family likes it. 🙂 Thanks for sharing!! My family loves spaghetti anything, so this will fit right in. Thanks! I know what’s for dinner tonight, Thanks!